Busy time in the studio and it feels like I can't catch up. 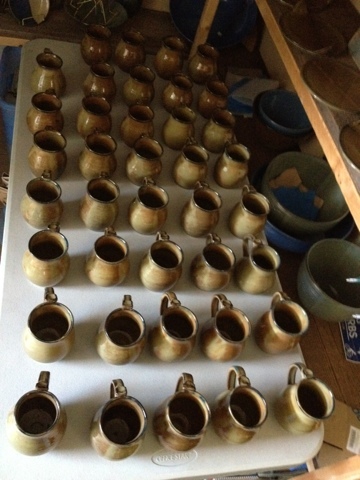 All the bisqued pots in the month old photo are gone out into their new homes! I am firing work now for the Arts on the Avenue art show in Ladysmith this Sunday. I should have a reasonable amount of work ready for this weekend but not the usual overkill that I am known for. My need to have a nap is now at the level that it actually overpowers me and if I don't go lie down for a while I wake up on the floor or on my chair or realize that I have been quite asleep standing at the wheel or wedging table. 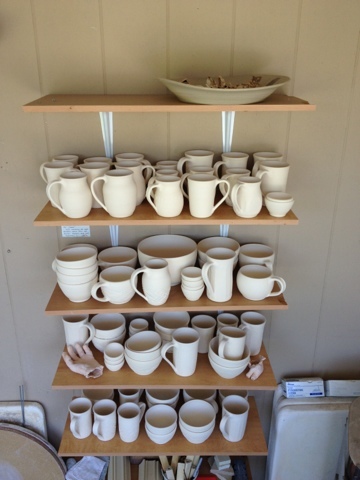 The other photo is of the mug order that I have been working on for a set for Hilary's Cheese Cafe to serve with. As it turns out they are now going to have a batch for sale as enough of their stock was stolen to start causing problems! Back to the studio, with several snacks in tow and I will work until the next nap time. Still at the Duncan Farmers' Market almost every Saturday. Today I need to unload the old kiln "Sputnik 2" and then glaze and load up the big girl. See you at the shows!